Hi everybody, I m from Brazil and been teaching for some time now, children and adults. I think this site is great and the only thing is that I would like to have more time to make better use of it. 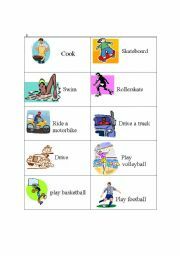 This can be used as a game, an ice-breaker activity, etc. 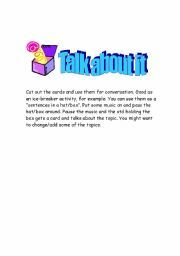 In pairs, one std has to talk to the other about a given topic and act according to what is written in the card. 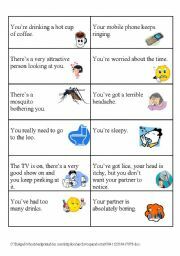 The other std has to guess what the problem/situation is. Lots of fun! 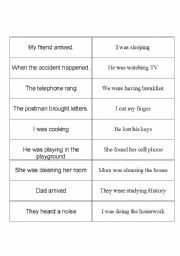 Cut the cards and ask the students to make sentences such as "When I was cooking I cut my finger". There are several possibilities/combinations. It can also be used as a domino activity. Questions on several aspects of Britain and its culture. 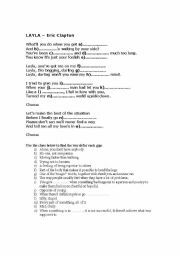 Exercises for review or extra practice. 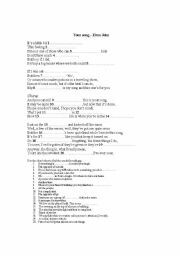 A very interesting song, fill-in-the-blanks activity + glossary + questions for discussion. Hope you enjoy. Fill in the blanks according to the questions below. 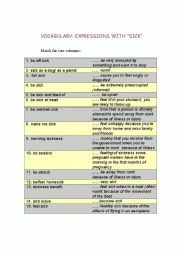 Vocabulary - expressions with "sick"
Cut out the cards and use them for conversation. Good as an ice-breaker activity, for example. You can use them as a �sentences in a hat/box�. Put some music on and pass the hat/box around. Pause the music and the std holding the box gets a card and talks about the topic. You might want to change/add some of the topics. Quick presentation about the book and movie, good introduction for working with either of them. Feel free to add more information according to your needs. Good exercise/presentation to review or even to introduce the idea of predicting based on evidences. Students can write or say their answers. Encourage them to be creative. It�s possible to have a competition to choose the best answers to the questions. Ask the students to put the sentences/questions in order by clicking on and dragging the words into the right place.